Curated by Prof. Judi Loach, School of History, Archaeology and Religion. 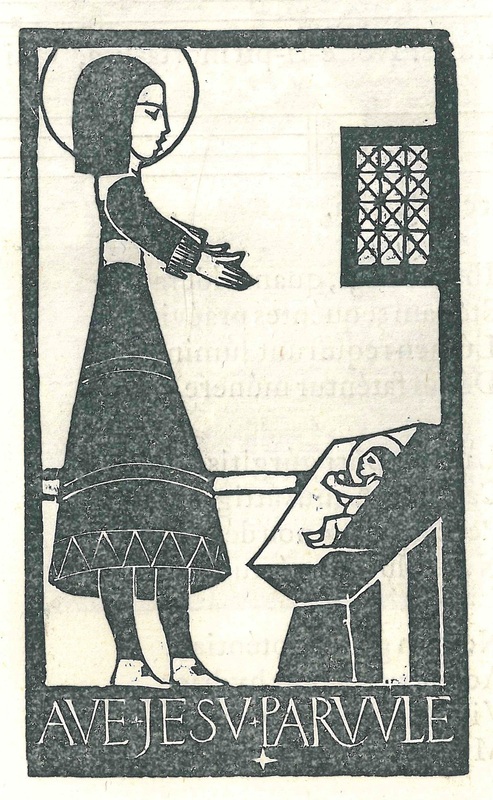 Images are reproduced with kind permission of the Trustees of the David Jones Estate. 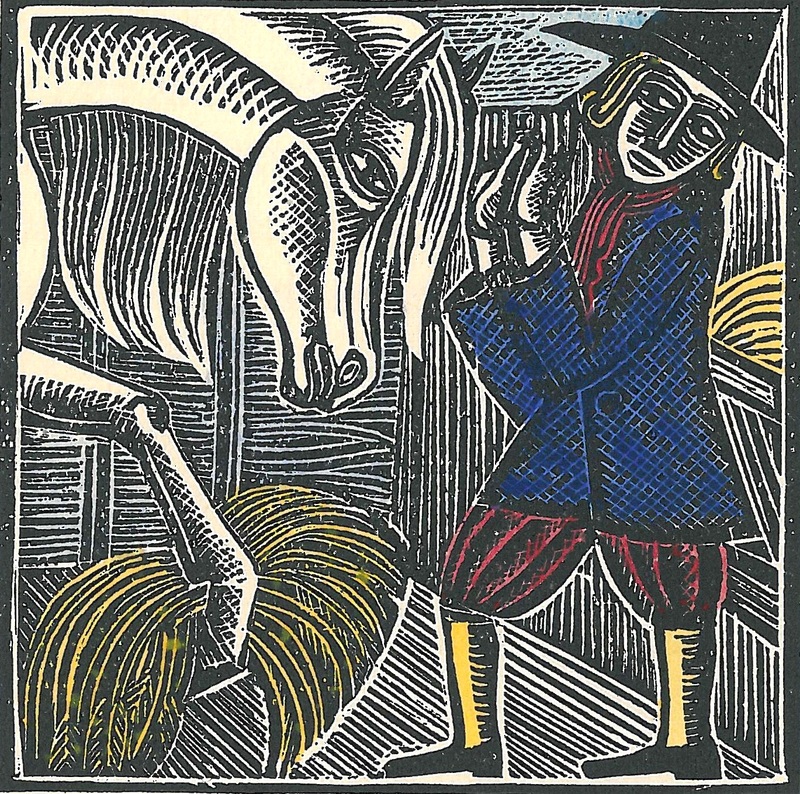 David Jones would become one of the leading figures in Britain’s inter-war revival of wood engraving, despite only working in this medium for little more than 5 years. 1924: Gill (1882-1940) moved to Capel-y-ffin; engaged to Gill’s daughter Petra. Jones now lived partly at home with parents in London, partly at Capel-y-ffin and partly with the Benedictine monks on Caldey Island. 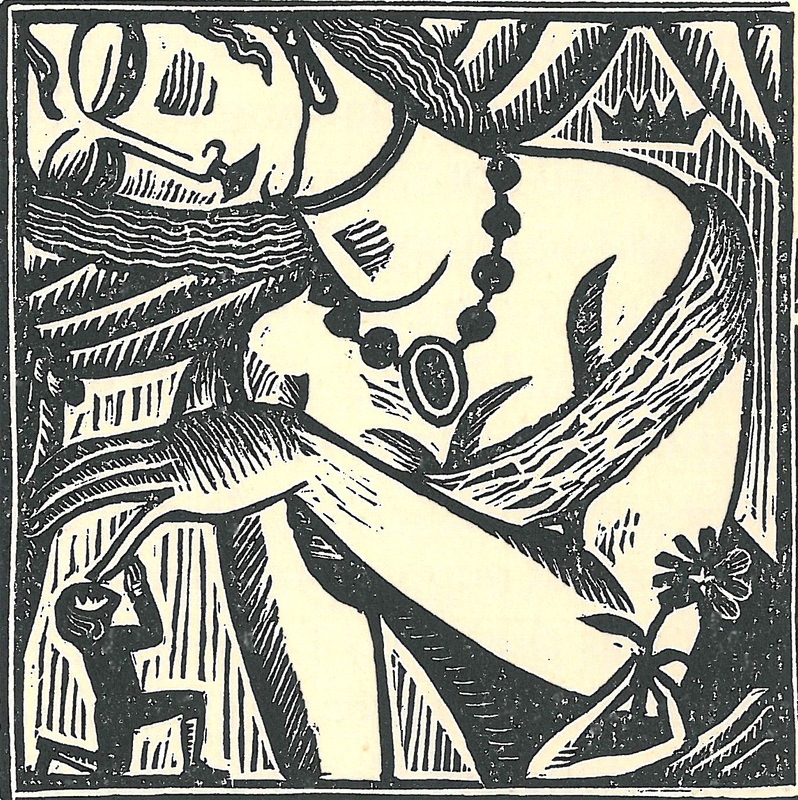 1927: Petra Gill broke off their engagement; Jones moved back to London, where he lived with his parents and was accepted into the Society of Wood Engravers. 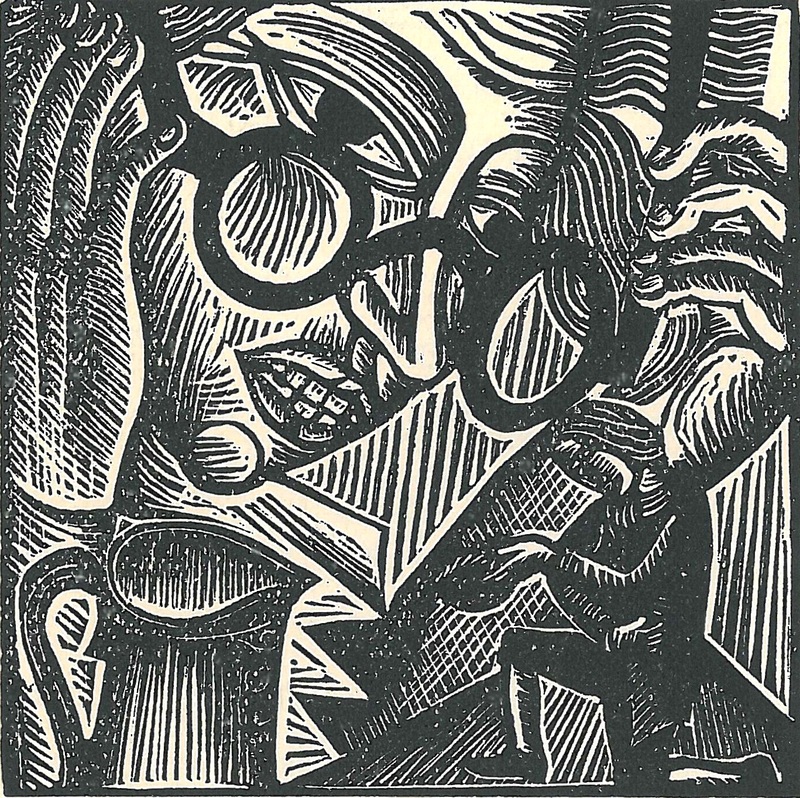 Eyestrain forced Jones to abandon wood engraving soon afterwards. 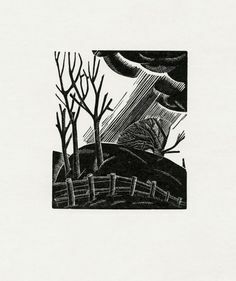 He focused instead on watercolour, bringing to it a certain complexity and ambiguity that he had developed through his wood engraving. He simultaneously began to write poetry, but while his painting was immediately acclaimed he would not publish any poems until 1937, when Faber & Faber brought out his book-length poem, In Parenthesis. 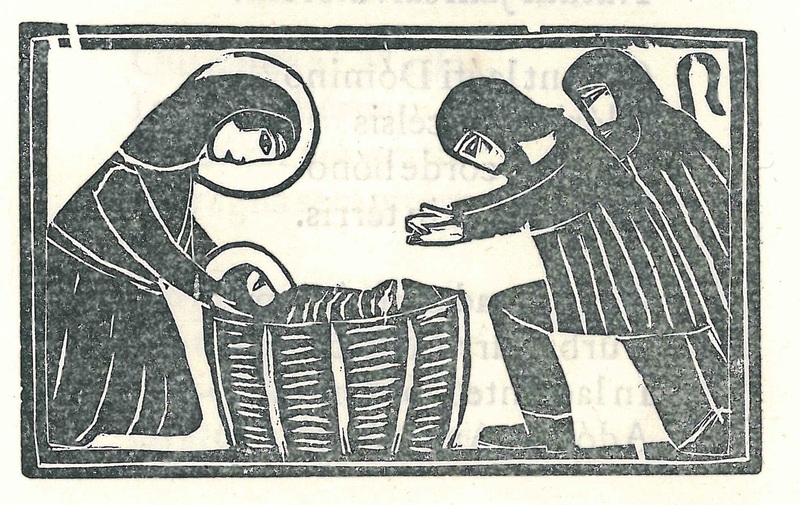 Eric Gill’s community of Catholic craftspeople at the village of Ditchling, in Sussex, was marked by a desire to return to a pre-industrial way of life, inspired at once by William Morris’s Arts and Crafts movement and by the Catholic revival. 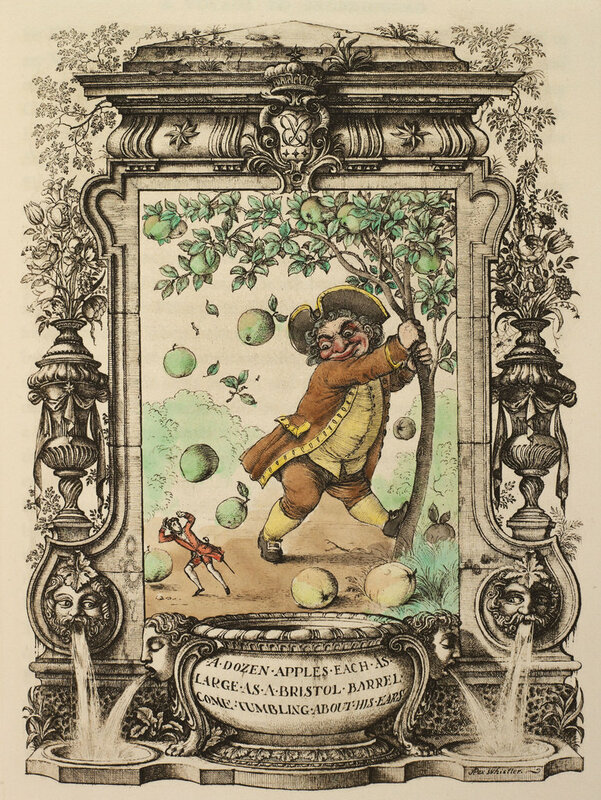 Many of the community’s pastimes embodied a rather childlike sense of innocent fun, reflected in turn in their publications. 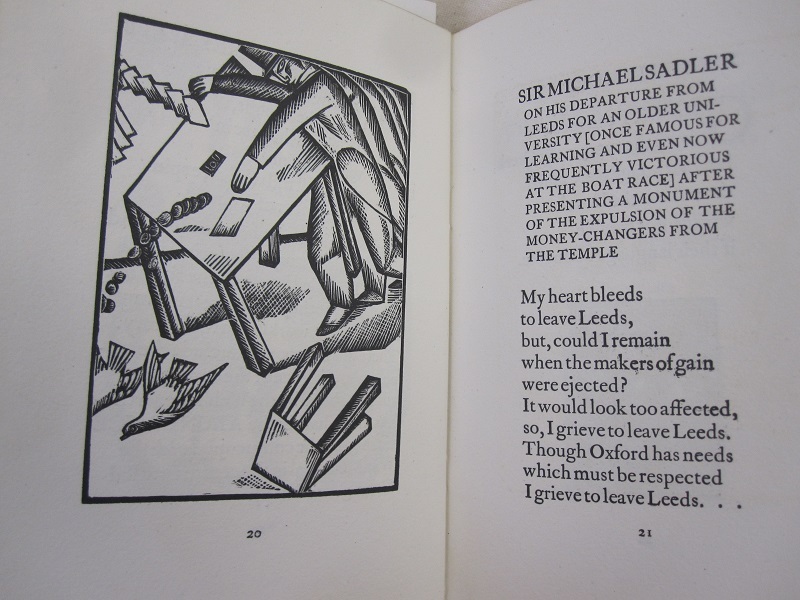 The community’s St Dominic’s Press renewed hand printing but produced relatively cheap book(lets) so as to maximise circulation. 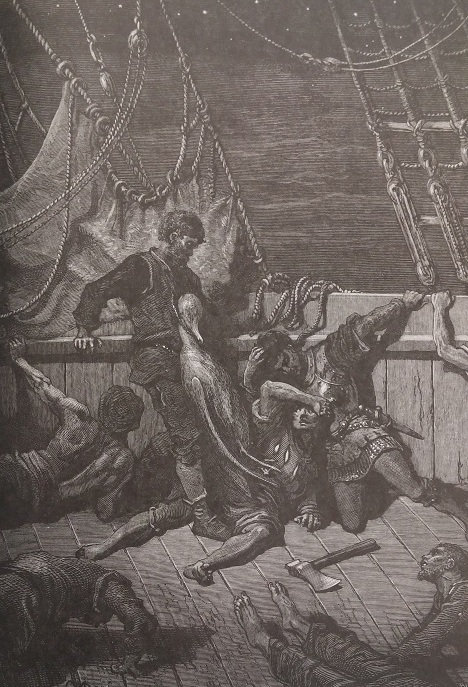 They therefore used wood, rather than copper, engraving, thus enabling illustrations to be printed simultaneously with text (copper engraving required printing on a separate press). 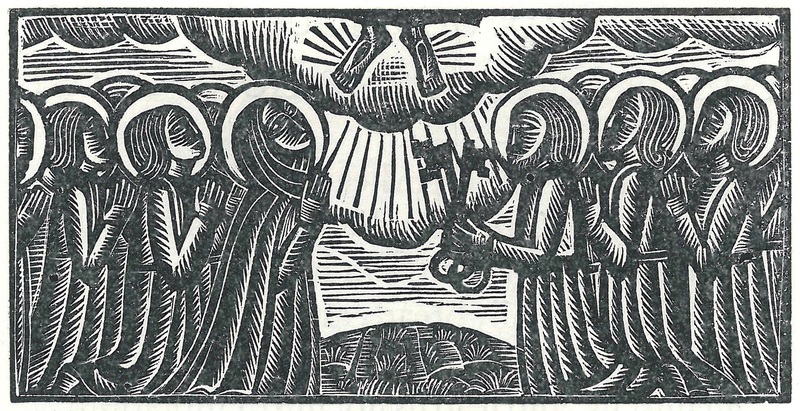 Jones joined soon after his own conversion to Catholicism, and began working in wood, simultaneously trying his hand at carpentry, sculpture and wood engraving. 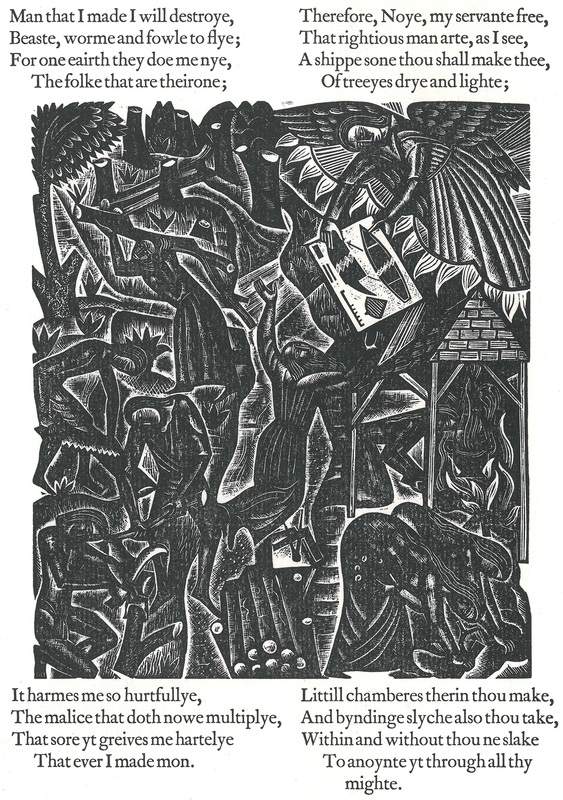 His exploitation of this material’s grain distinguishes his work from that of his colleagues there, who tended to exploit the medium as a means of either creating scarcely detailed black silhouettes (e.g. some of Desmond Chute’s in Pertinent and Impertinent) or reducing to lines alone (e.g. 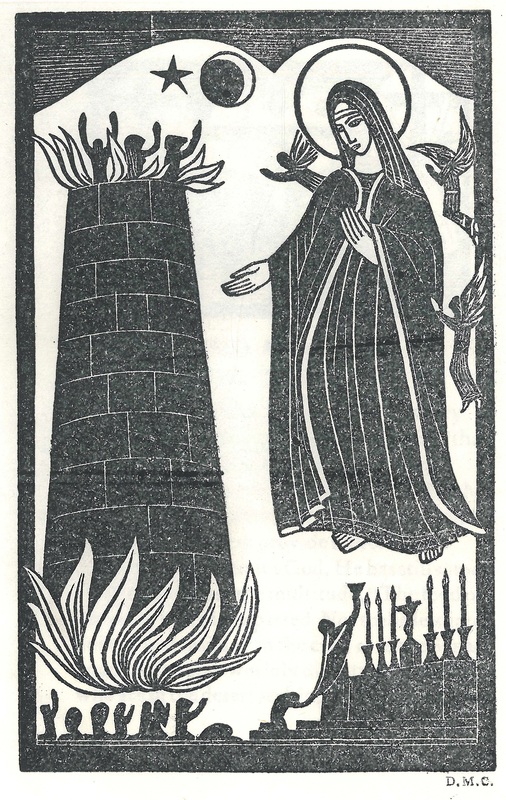 Desmond Chute’s ‘Nazareth’, in Songs to our Lady of Silence, 1921). 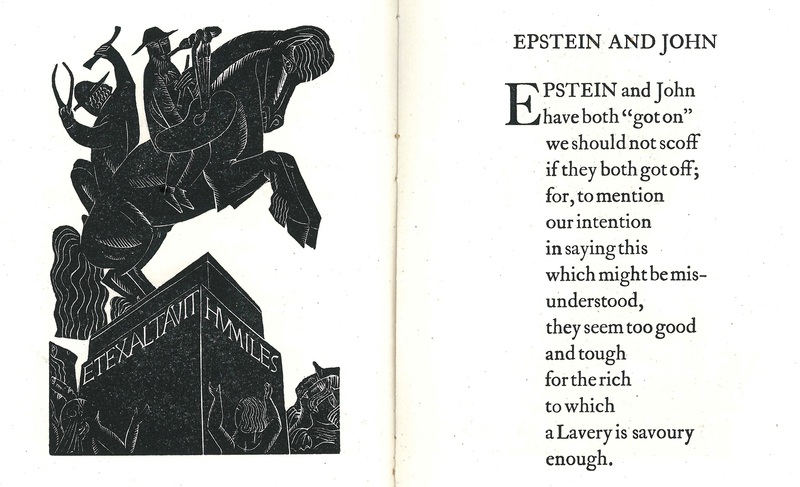 D. C. Pepler, Pertinent and Impertinent (St Dominic’s Press, 1926). 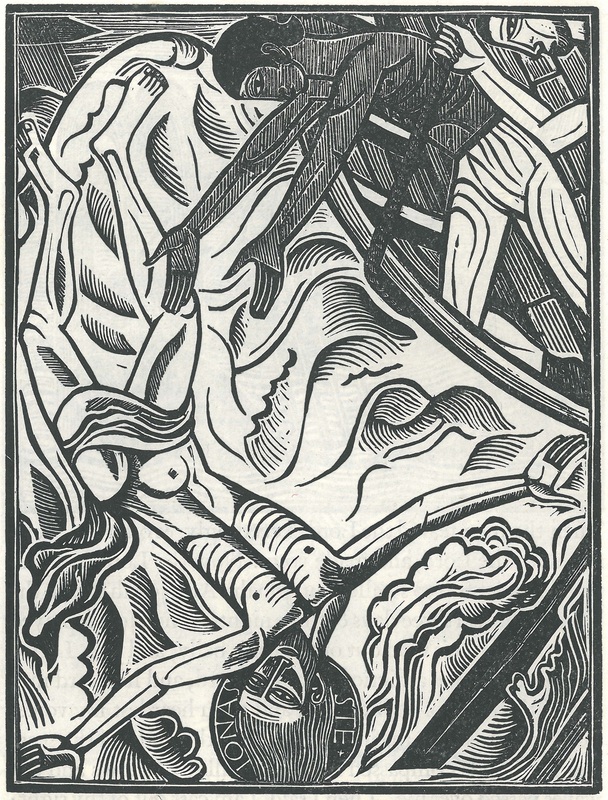 Illustrations by David Jones and Desmond Chute. Jones, as yet unsure of his own style, betrays the influence that various contemporaries made on him. 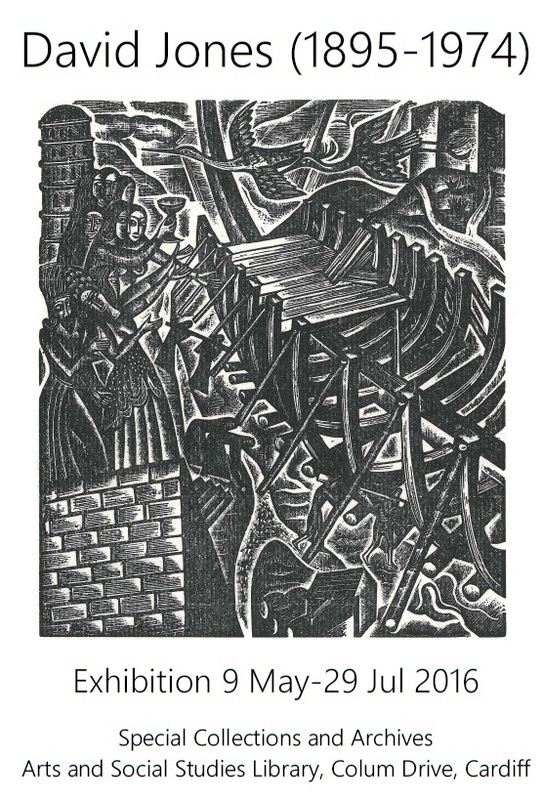 In ‘March’, one sees Paul Nash, equally touched by experience of war-scarred landscapes, while in ‘The Milkmaid’, the German Expressionists. 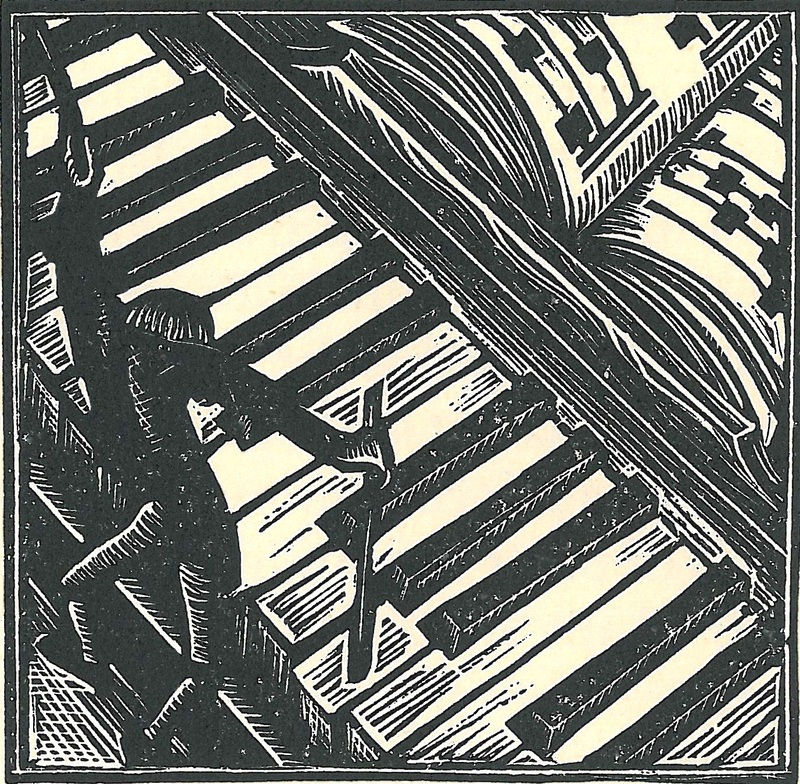 Both contrast with the approach of his wood engraving teacher Desmond Chute (e.g. ‘Nazareth’). Untitled by Desmond Chute. Pepler, Pertinent and Impertinent. Desmond Chute, Nazareth. Woellwarth, Songs to our Lady of Silence. Desmond Chute, Egypt. Woellwarth, Songs to our Lady of Silence. Desmond Chute, Bethlehem. Woellwarth, Songs to our Lady of Silence. 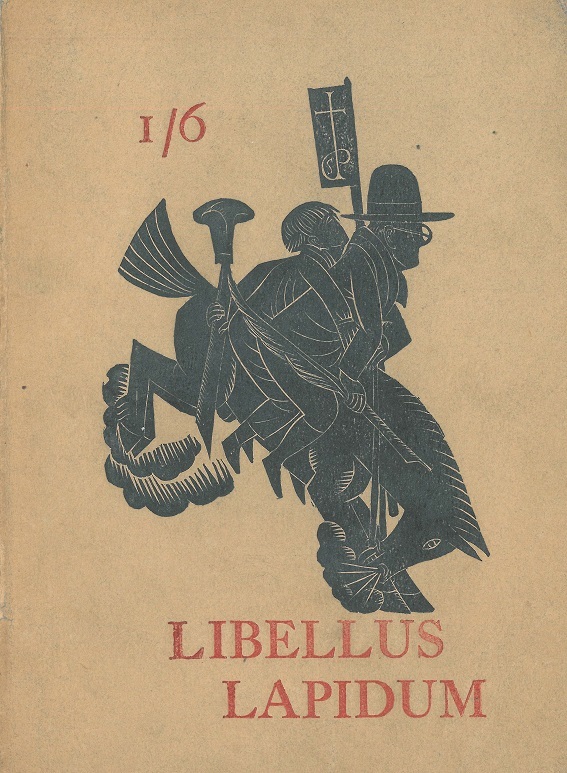 D. C. Pepler, Libellus lapidum (St Dominic’s Press, 1924). Handwritten annotation by Pepler on flyleaf: ‘The author is ashamed of some of these verses but not of their printing’. 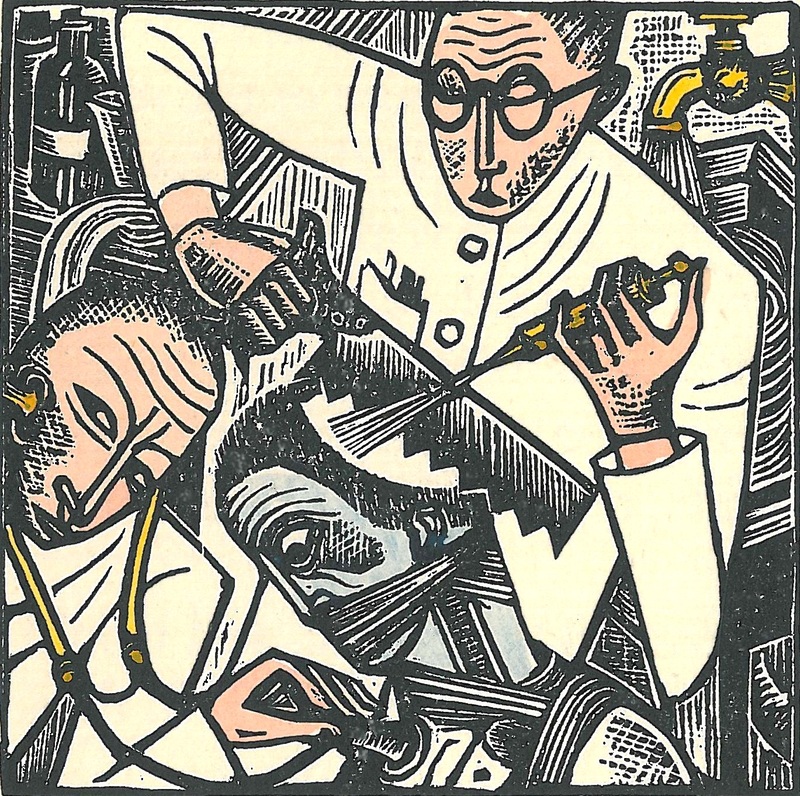 The cover shows Jones (with his schoolboy haircut), clinging on behind Pepler while also hanging onto his engraving tools, metaphorically his knightly weapons. 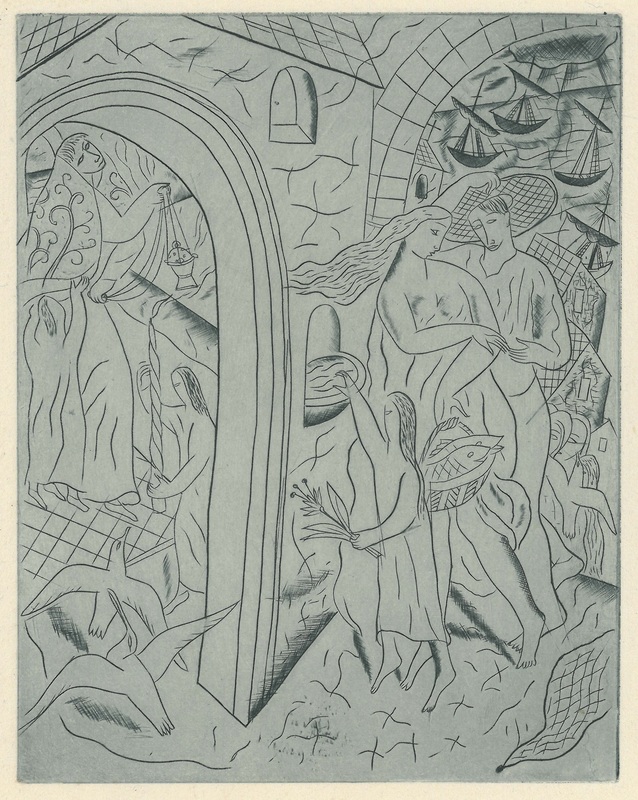 Jones experimented with Vorticism (Sadler) and primitivism (Shaw). 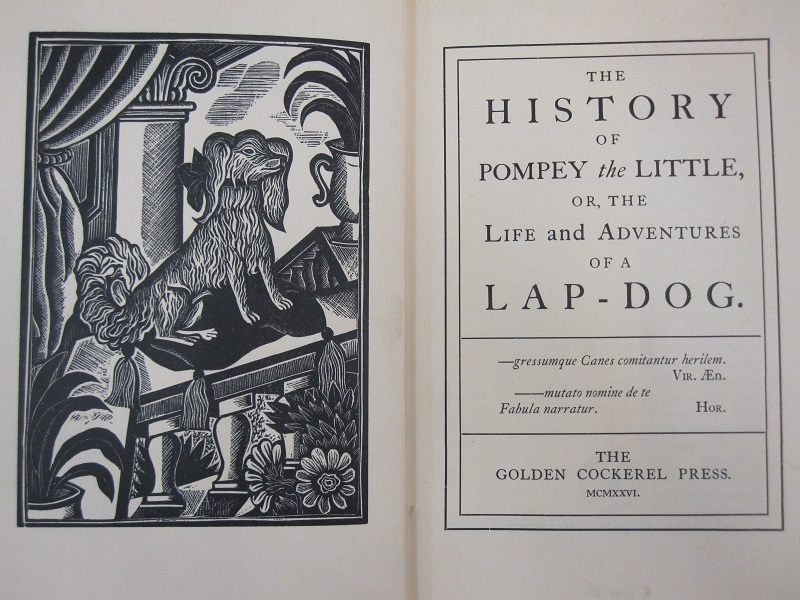 Francis Coventry, The history of Pompey the Little: or, The life and adventures of a lap-dog (Golden Cockerel, 1926). 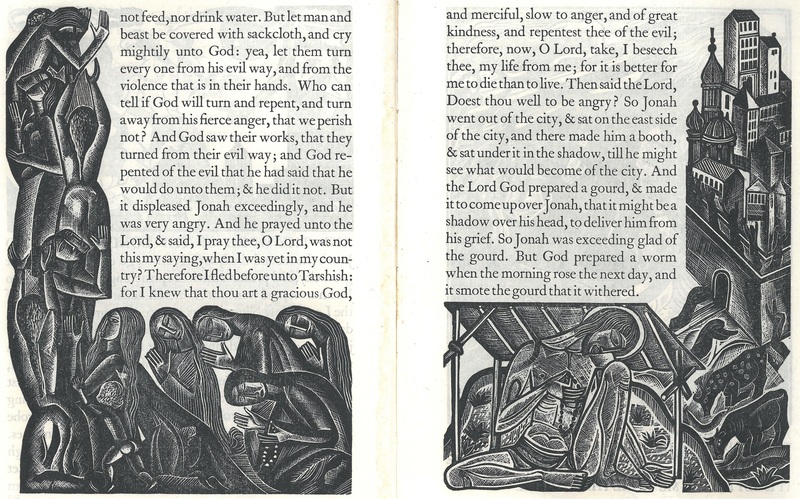 In the same period Jones was producing work for the secular, and more fashionable, Golden Cockerel Press, where he displays a tendency to be influenced by its milieu, e.g. aping early modern imprints. 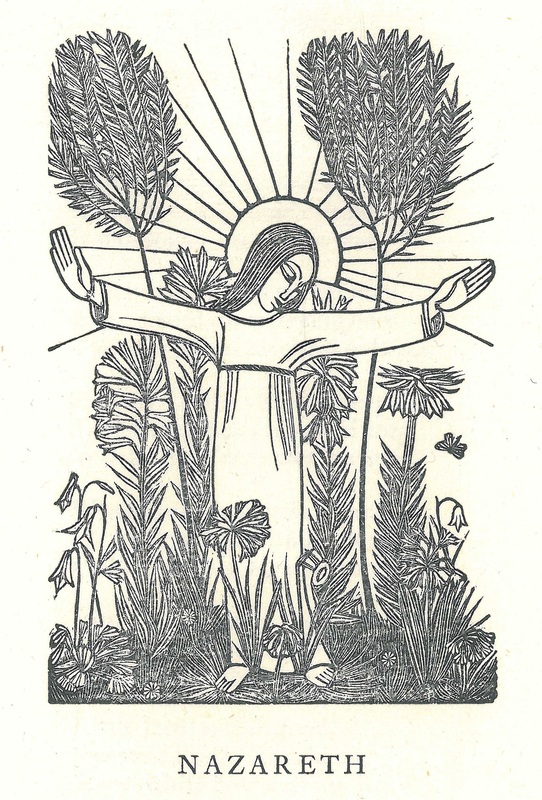 A Child’s Rosary book (St Dominic’s Press, 1924). 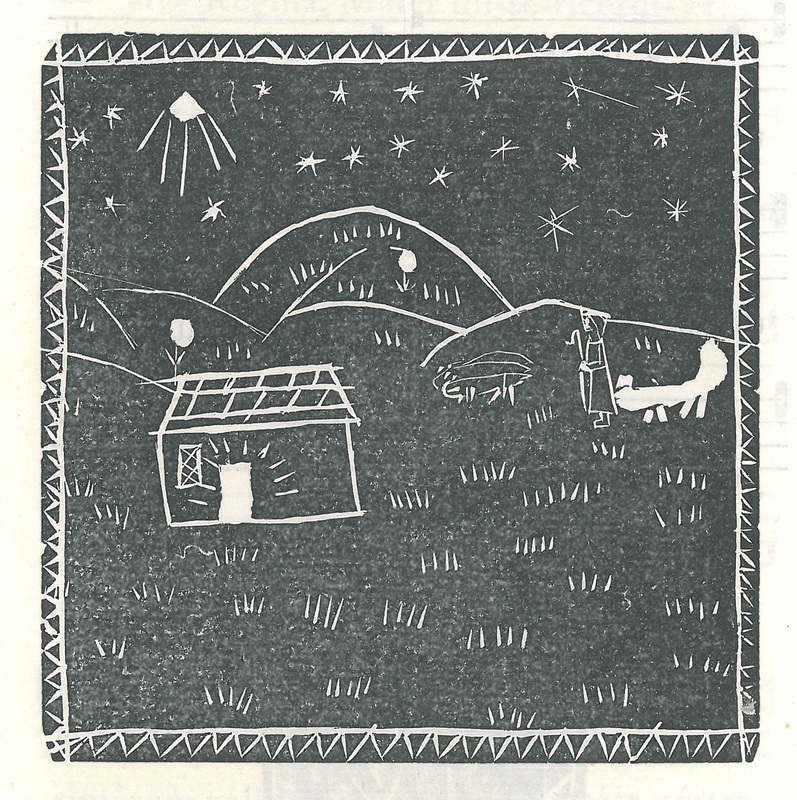 Here, in one of Jones’s earliest wood engraved works, he deliberately uses the grain of the wood to obscure an immediate reading, thereby forcing the child to spend time with the image, which is intended as a stimulant to meditation, time and again, not merely as a single-use didactic illustration. 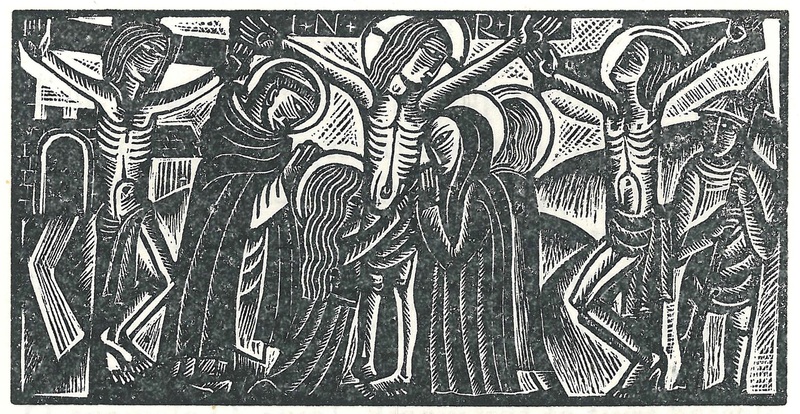 The Way of the Cross (1917): derived from his stations of the Cross for Westminster Cathedral. 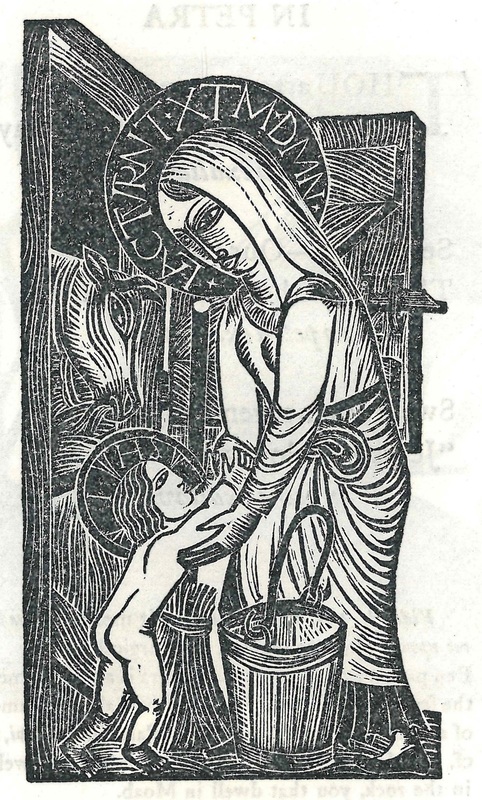 Horae Beatae Virginis (1923): This is inspired by mediaeval breviaries, with most of the woodcuts taking the place of illuminated initials, but without bearing initials! 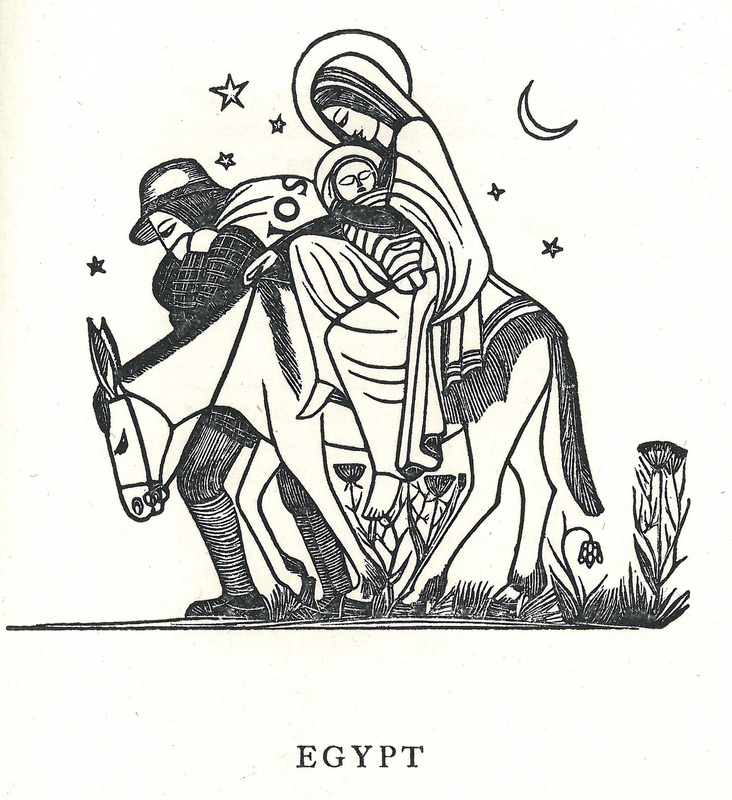 Common Carol Book (1926): Whereas the artist Jones’s Primitivism was influenced by that of Modern art, notably German Expressionism, the craftsman Gill’s is rather inspired by early modern woodcuts, or else often uses drawings by children in the Ditchling community, some seemingly worked in a kind of scraperboard. 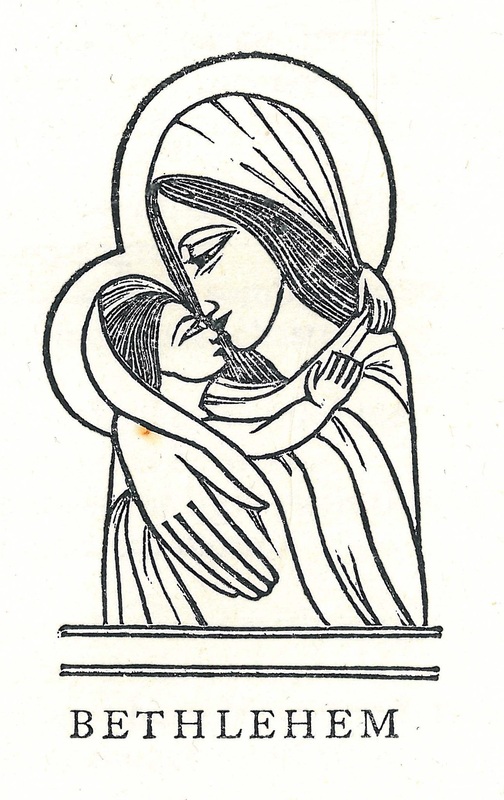 Common carol book, illustrated by Eric Gill. 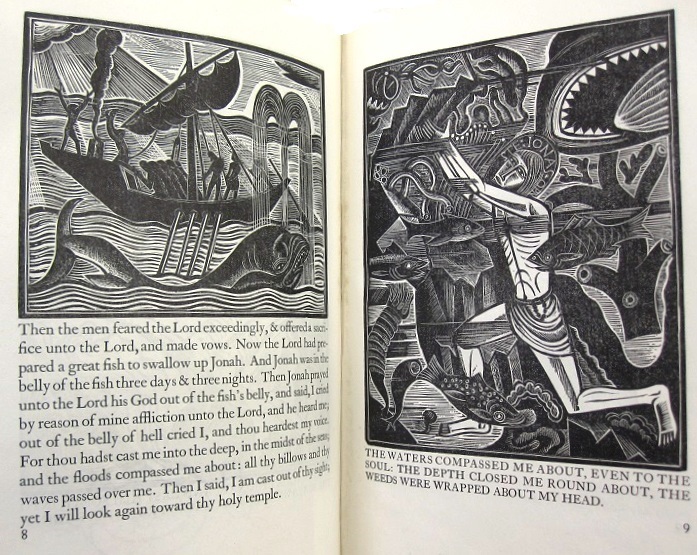 The book of Jonah (Golden Cockerel, 1926). 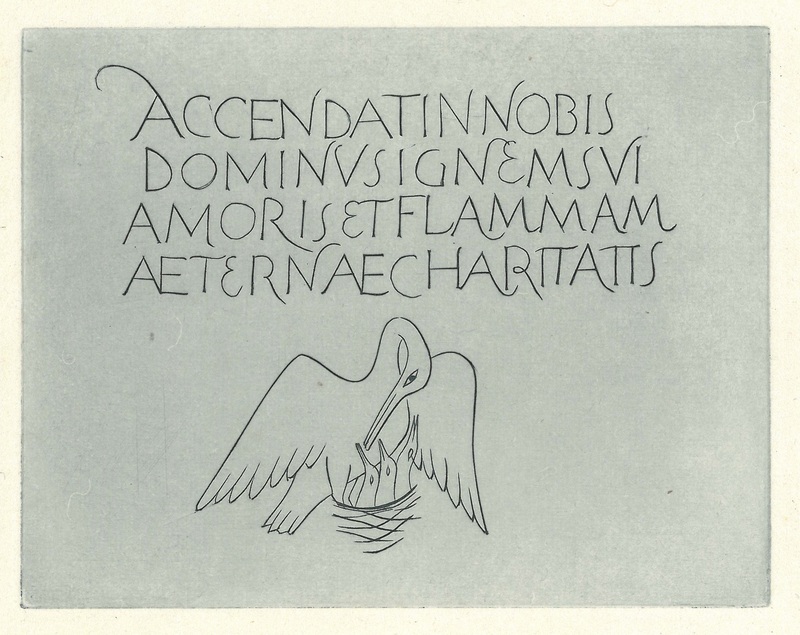 Despite the change from St Dominic’s (cheap – trying to get the material into as many hands as possible) to Golden Cockerel, Jones retains his commitment to making the ‘woodiness’ of his printing block apparent in the print on paper, and to a degree of complexity (at the expense of immediate clarity) so as to force the viewer to engage with the image. 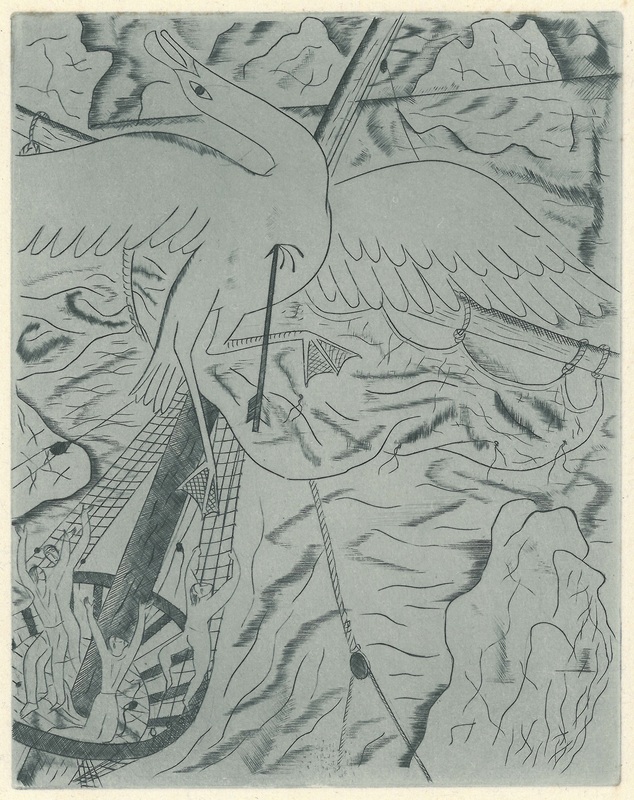 Chester play of the Deluge (Golden Cockerel, 1927). 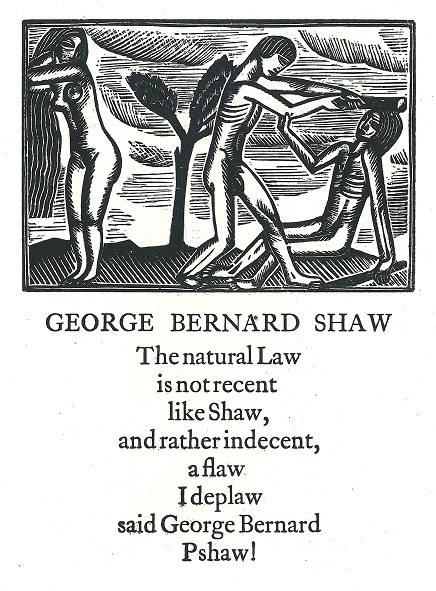 Although this was probably his finest set of wood engravings, they were printed rather faintly, which upset Jones. 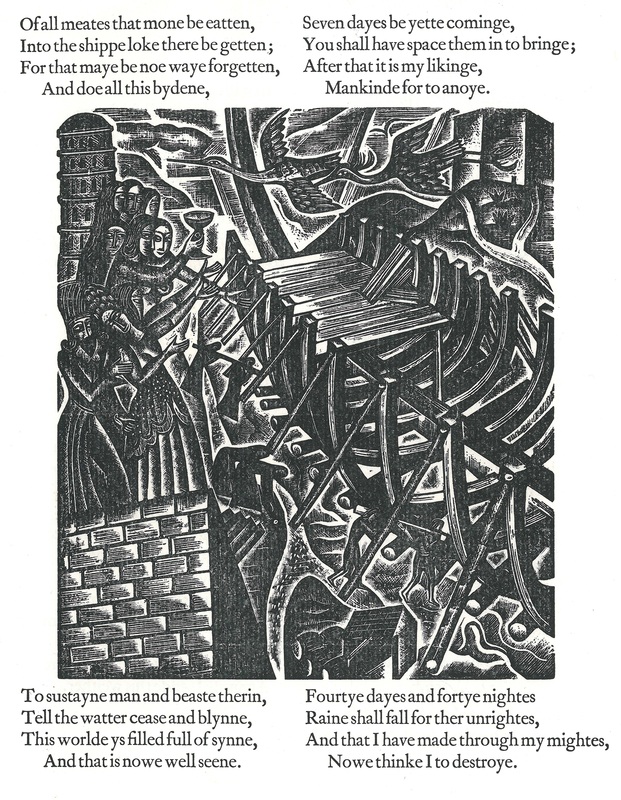 The scenes depicting the building of the ark may be intended to evoke Jones’s grandfather’s labours in the London dockyards and/or his own less successful attempts at carpentry when in Ditchling. 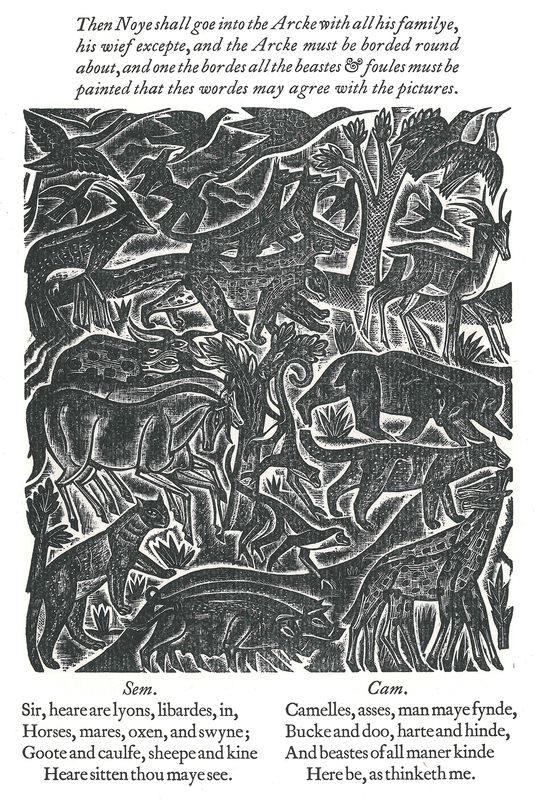 His loving portrayals of various animals, each with their own characters, draws on his sketches at London Zoo. Llyfr y pregeth-wr. 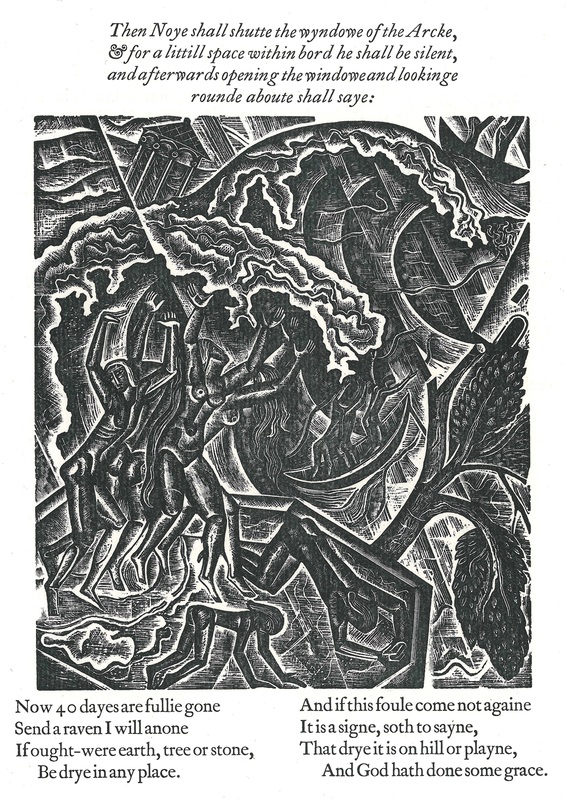 [Ecclesiastes] (Gregynog, 1927). 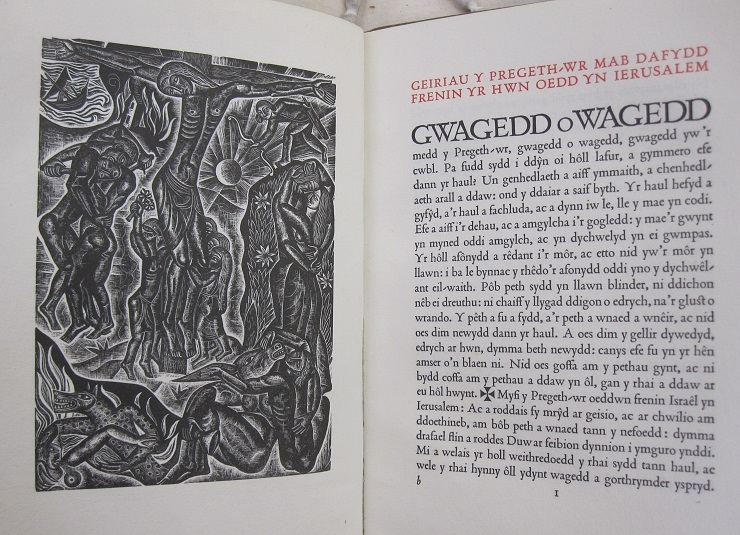 For this more abstract scriptural text, a volume commissioned by the Welsh Davies sisters and published in the same year as the Golden Cockerel’s Deluge, Jones provides a single engraving, as frontispiece. 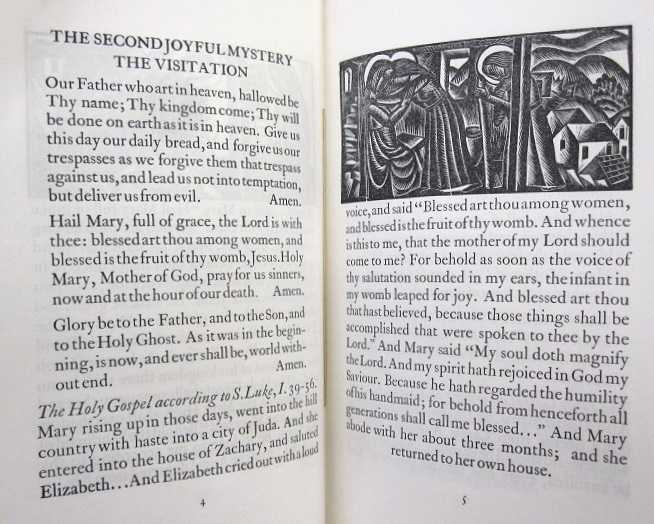 Printed and bound by their Gregynog Press, this is a particularly rare book, as only 25 copies were printed. 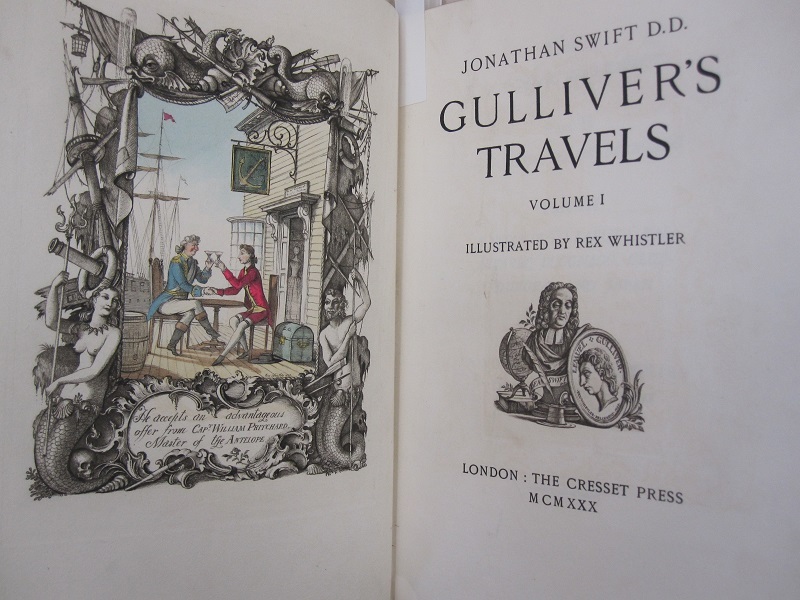 Jones was attracted to texts open to multiple and/or inner meanings, such as Jonathan Swift’s satire on human nature, clothed in the form of a fictional traveller’s tale. 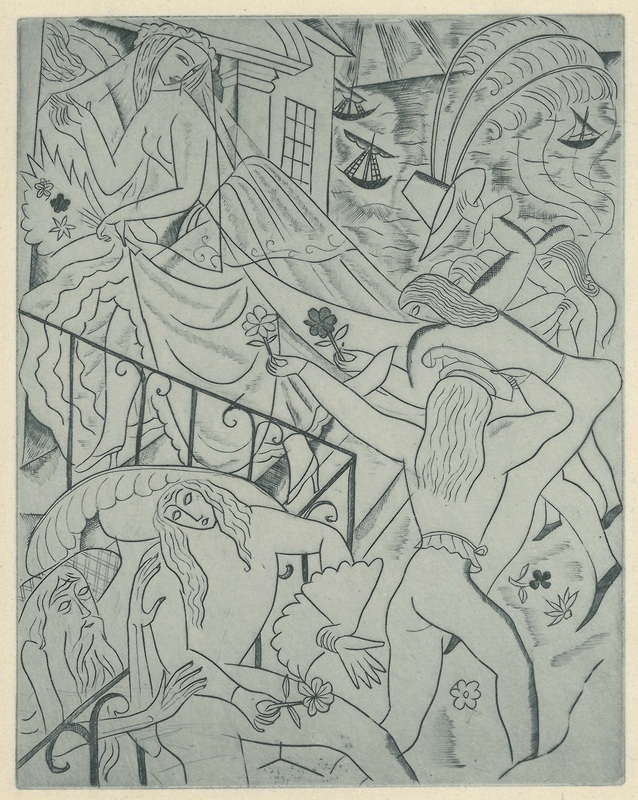 Here we can compare David Jones’s treatment (Golden Cockerel, 1925) with that by the fashionable artist Rex Whistler (Cresset Press, 1930). 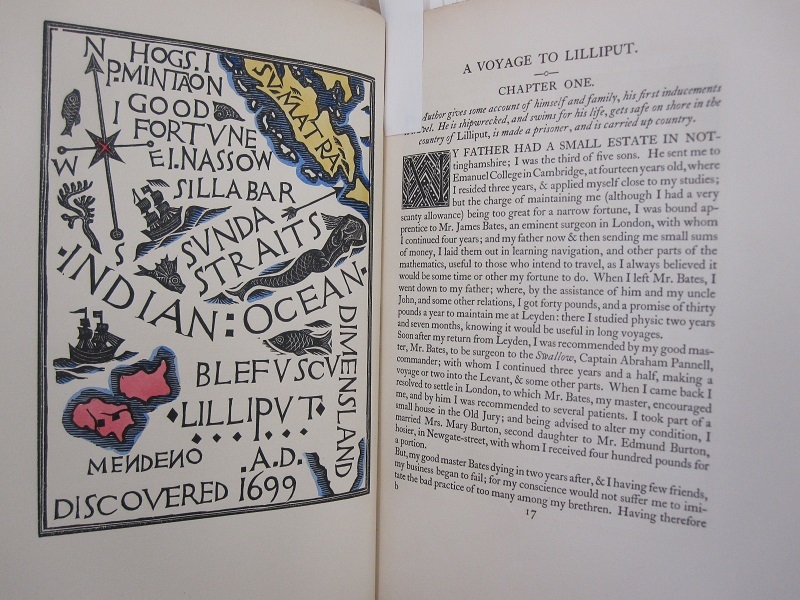 Apart from the full-page maps, Jones uses small wood blocks inserted into the running text. As before, he exploits the ‘woody’ character of his base material to obscure immediate understanding of the image’s meaning. 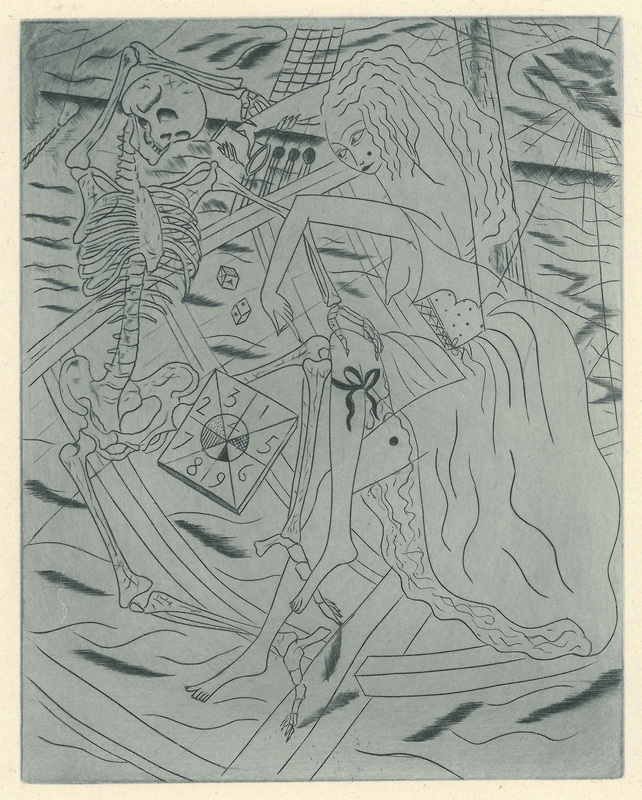 He was upset when his publisher commissioned art students to hand-colour many of his images, probably in part because this rendered their meaning immediately apparent. Whistler, by contrast, mainly provides full-page illustrations, more literal yet also more comic; each of these is presented within a frame appropriate to its subject (framing a monarch in a Classical architectural arch or a peasant in a pergola of agricultural implements), in a way reminiscent of Whistler’s work as a designer of stage sets. Swift, Gulliver’s travels, illustrated by Rex Whistler. 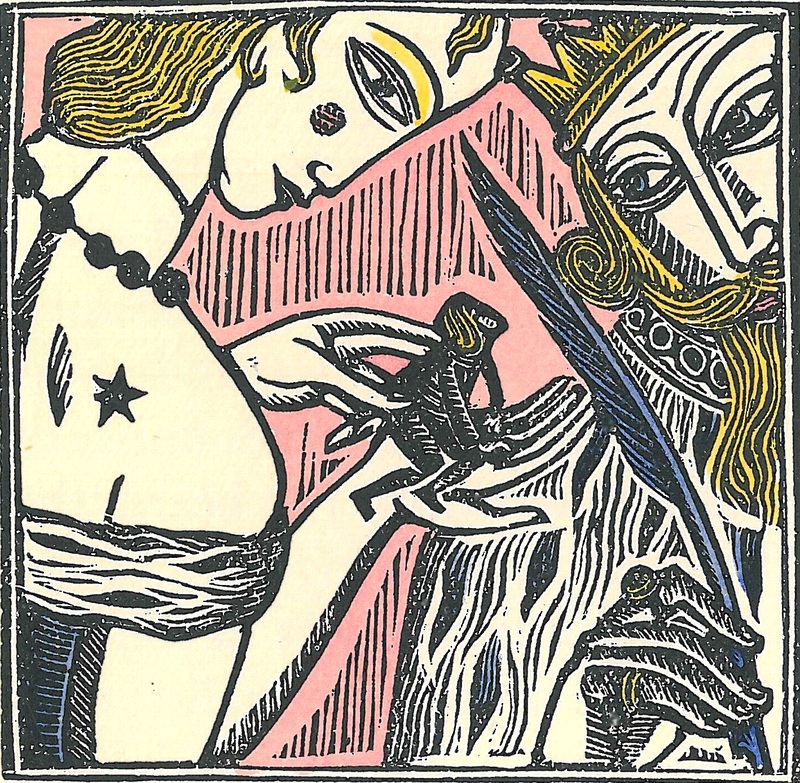 David Jones was attracted above all to texts with potential for metaphysical interpretation. 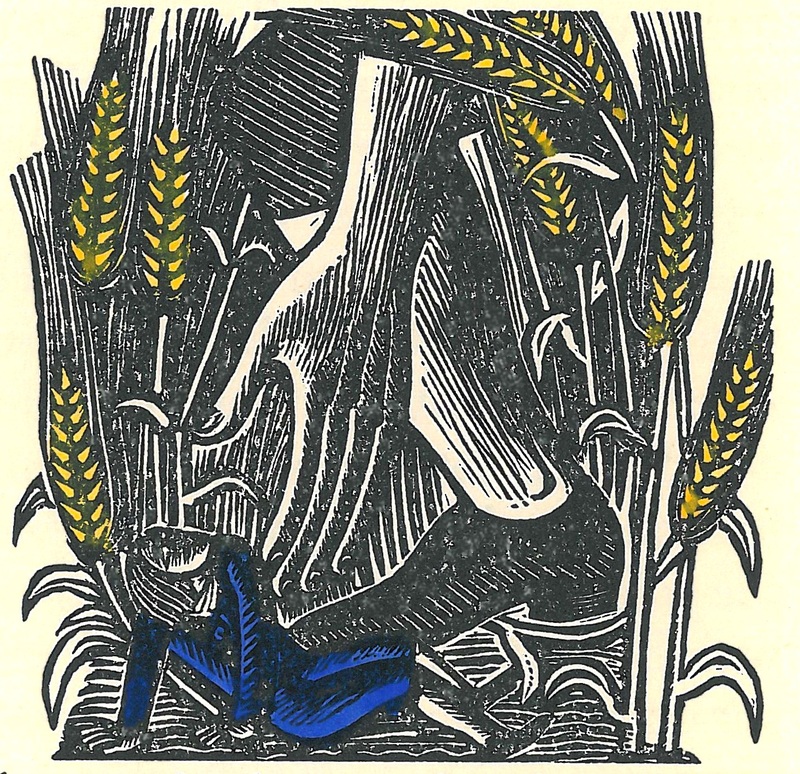 In Douglas Cleverdon’s 1929 edition, the wedding guest to whom the Ancient Mariner recounts his tale becomes a figure of one who accepts Christ’s invitation to his celestial marriage feast, leading the subsequent tale to become an allegory of the appreciation and acceptance of divine grace. 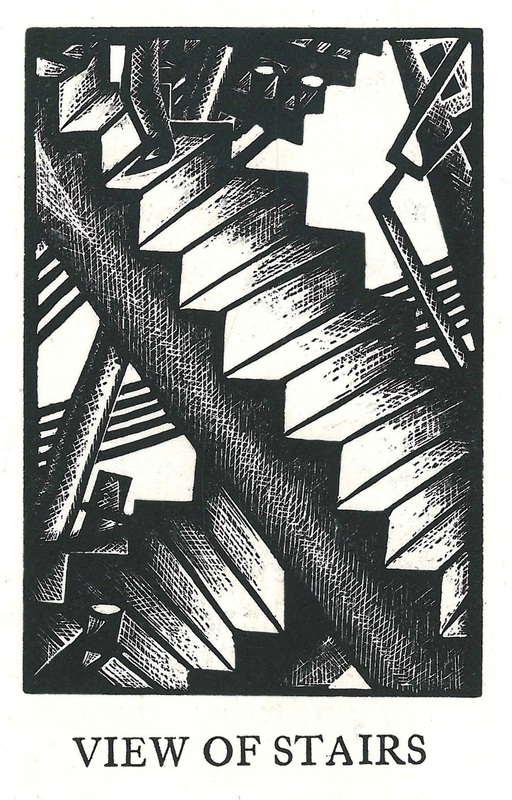 Jones is using copper engraving instead of wood engraving, and so is focusing on the line, rather than on any mass. 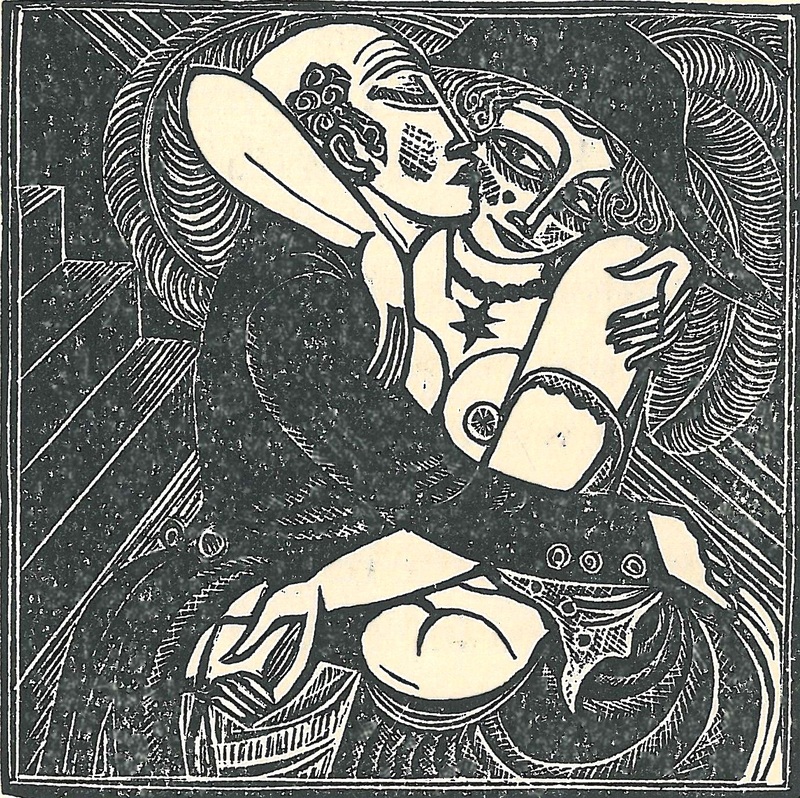 But he carries over from his wood engravings an intrinsic sense of ambiguity, or polyvalence, accentuated by not washing the plate before printing, so as to imbue the background with a certain ghostliness. 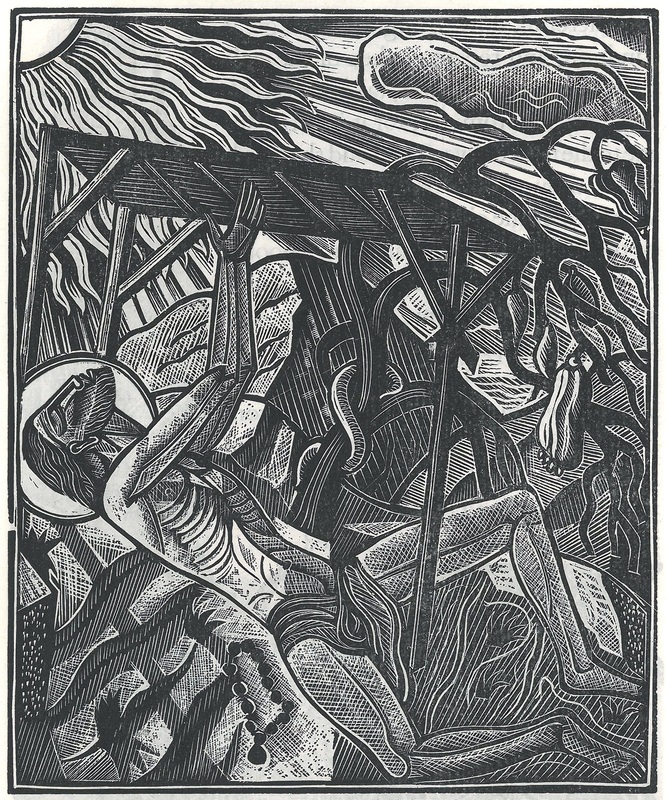 Jones’s metaphysical understanding of the narrative is emphasised in a central image that personifies the figures of ‘Death’ and ‘Life in Death’, but also in the allusion drawn, through his addition of a final tailpiece: the pelican voluntarily giving its own blood to feed its young, traditionally a figure of Christ sacrificing Himself for his Church, sinners like those who killed Him, is implicitly placed in parallel with the albatross, whose death was involuntary and ineffectual. 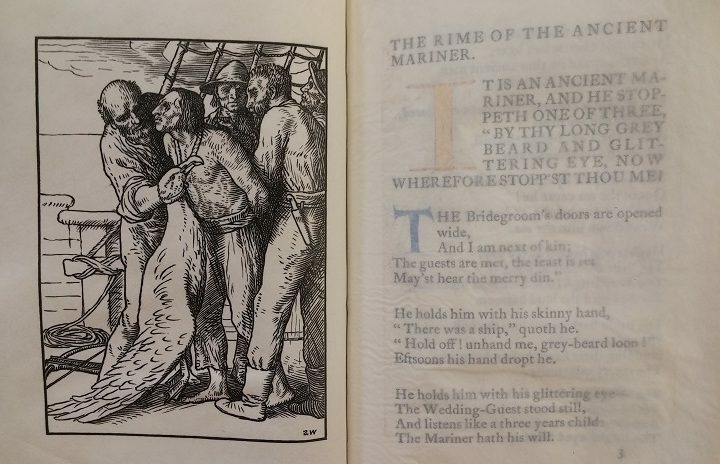 For the edition produced by his Arts and Crafts Essex House Press, CR Ashbee selected a single incident from the narrative for illustration by Strang: the crucial moment when the albatross is hung around the Ancient Mariner’s neck. 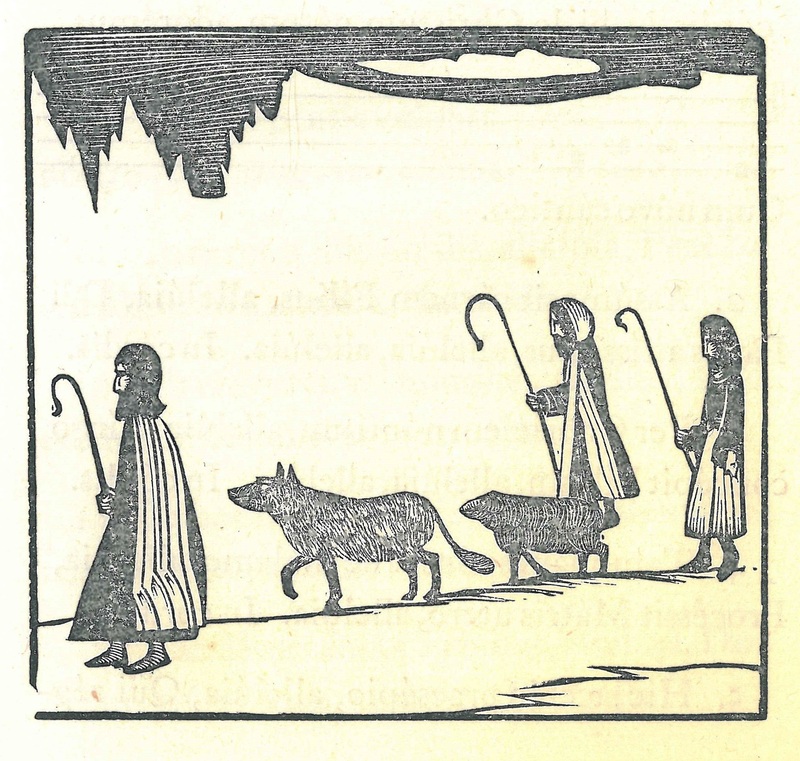 Coleridge, Rime of the ancient mariner, illustrated by William Strang. 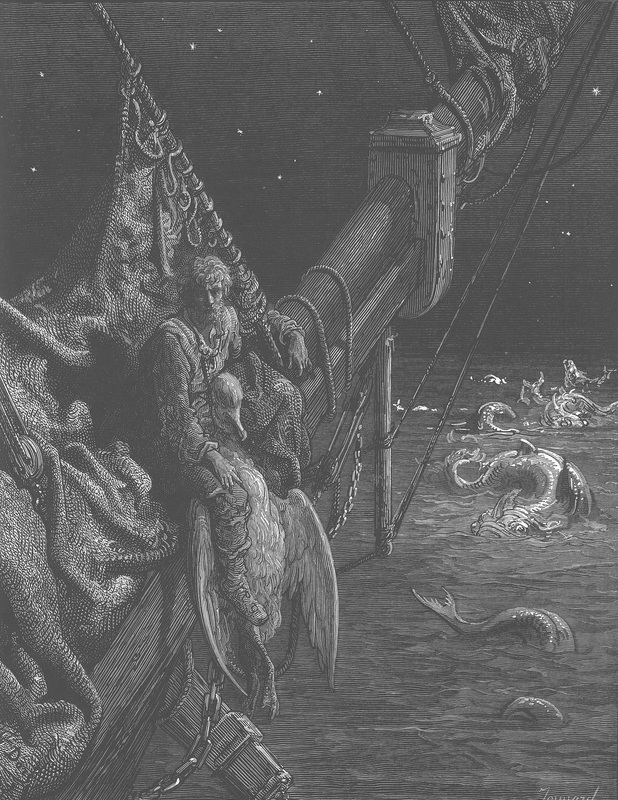 Doré illustrates each episode in the narrative, and does so naturalistically, almost like a series of photographs. As embodiments of Victorian romanticism, the plates tend to depict these scenes darkly, indeed almost invariably at nighttime. 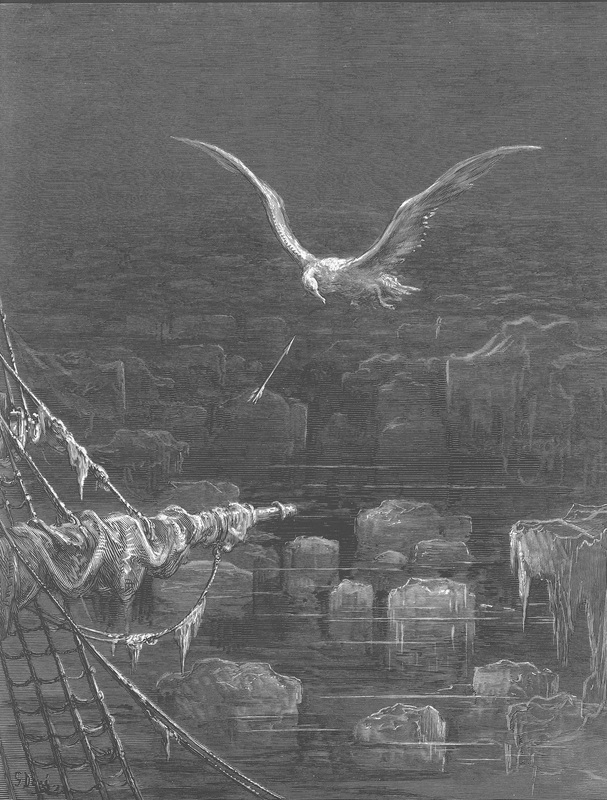 Coleridge, Rime of the ancient mariner, illustrated by Gustave Doré. 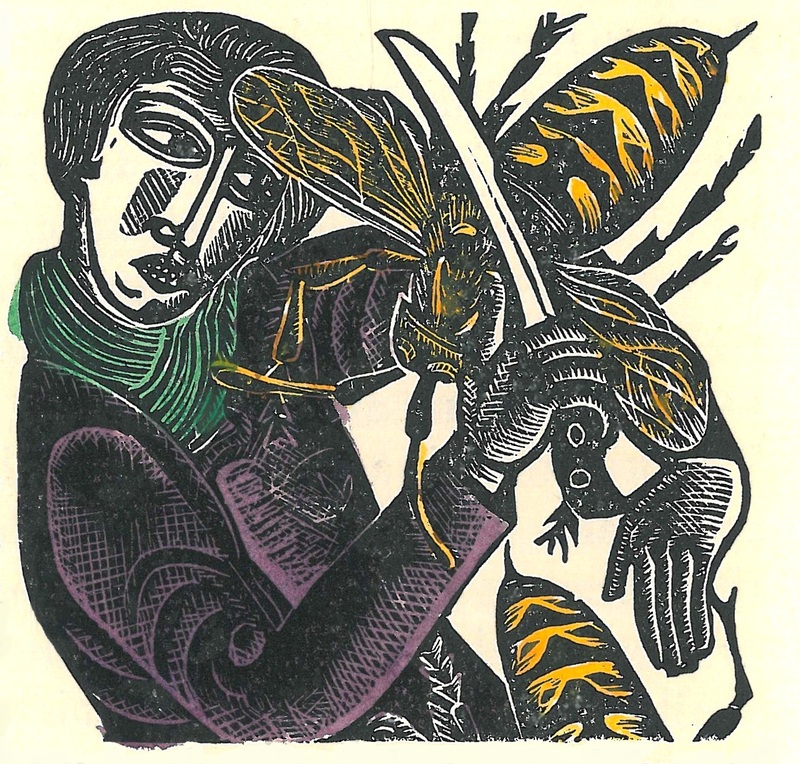 This entry was posted in Alison Harvey, Exhibition and tagged book illustrations, copper engraving, David Jones, exhibitions, modernism, wood engraving, woodcuts. Bookmark the permalink. This is a paradigm for an exhibition of this sort; not huge, but tautly curated, with contextualising material with its own interest, alongside the main (and hugely important) subject. Bravo.